Hello Kentucky Derby weekend! Aside from the actual race, the derby brings out some really dressy style with preppy attires and fancy hats. The whole derby style just reminds me of Gatsby! This Casual Derby outfit features a staple derby look with a modern update for us young lads haha. I took all four looks from the illustration guide, mixed and matched it to become my personal "Levitate Style". Any Derby look starts off with the essential sport coat and bright color chinos. I dressed down the outfit with a nice pattern detail polo from the latest Michael Bastin x Uniqlo collection while still looking sharp without being stuffy in the traditional shirt and tie. I didn't want to pull out the big guns yet with my seersucker suit (saving it for a summer wedding look later) so I threw in a seersucker pocket square to add in that extra detail. Hope everyone have a fun weekend with the derby or not - go out there and enjoy it! This is absolutely classic; the details in the shirt and pocket square make this look! Awesome! 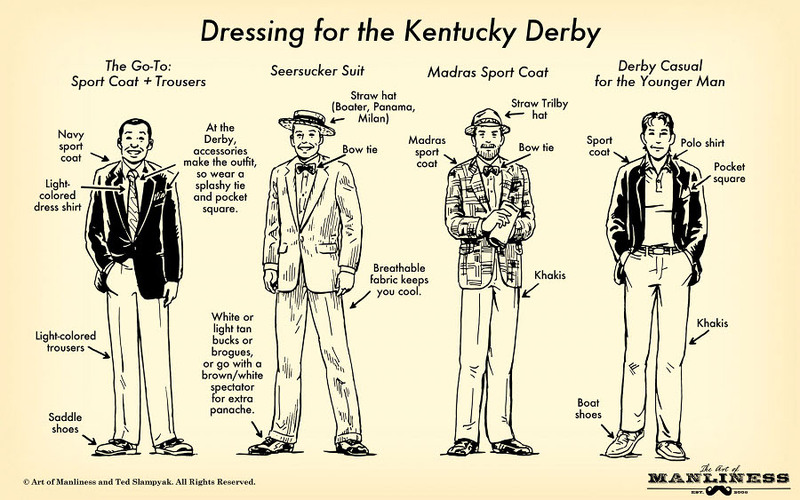 I love that you did some research into the classic derby style for men. I love all of the accessories you added to make a polished look--the fedora and the handkerchief are great touches! I love the suit jacket, it has great colors and pulls everything together nicely. Well done!